It all starts with a mysterious phone call from Louisa's decorative antique phone. And that wouldn't be so strange, except that the phone is unplugged, and has been for years. Frightened by the call and its message--and questioning her own sanity--Louisa listens as a somehow-familiar voice describes a lost family secret about Louisa's grandfather and his daring involvement in resisting the Nazi scourge in his native Sweden during World War II. Piecing together each clue she can find, Louisa begins to see how her grandfather's guilt and shame continues to haunt her own father, and the rest of her family, decades later, planting seeds of doubt that threaten to tear them all apart. Now desperate to know the full truth, despite the charming distractions of a boy with secrets of his own, Louisa becomes consumed with her discoveries, which she passes off to her parents as a school history project. Digging through old family albums and letters, she at last begins to see that the phone call was only the beginning, and that she is the one meant to be the messenger who can bring the truth of the past to light--before it's too late for her family. When Louisa's mother dies of cancer, her entire family falls apart. Her dad and her sister both retreat inside themselves and become introverted. The entire family becomes disconnected. All that starts to change the moment they have to move back to her grandmother's house. With her grandmother's passing, Louisa's family must sort through the possessions and settle down. Everything seems to be ordinary until one evening Louisa hears the phone ring, it isn't from a cell phone, or the house phone, but a disconnected phone that hasn't been used in ages. She is the only one that can hear it! This well written tale from debut author Jessica Lidh, skillfully weaves the somewhat unknown history of Sweden's involvement in World War II with a gripping tale of loss, family, and belonging. Always a avid reader of World War II historical fiction and nonfiction, Sweden's involvement is new to me and I found this intriguing. The entire story is crafted so well that it does not feel like a history lesson. As a reader you are drawn to Louisa and her cause. Her search for the truth becomes the reader's search for the truth. Adding the paranormal element makes this story a page turner. The tragic story of Louisa's grandfather slowly unravels each time Louisa gets a phone call. There are subplots and twists that keep the reader's interest. There was only one thing that left me wanting more. As a reader, I wanted to know more about Louisa and her interactions with her family, especially after her family secret was discovered. Overall the book was a quick read that was not only entertaining but informative. Definitely a novel you don't see every day on the shelves. 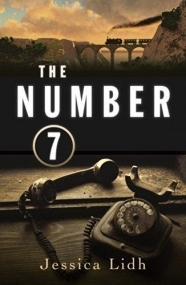 Fans of historical fiction and the World War II genre will especially enjoy this book.